The Bosnian civil war was planned and orchestrated by the government of the United States. The US ambassador to Yugoslavia, Warren Zimmermann, was directly responsible for starting and perpetuating this needless civil war. In other words, the US government was responsible for the Bosnian civil war and the subsequent loss of life there.Izetbegovic’s vision of Bosnia was not a multi-ethnic democracy, but a multi-caste hierachy of the kind that existed under the Ottoman Empire, the memories of which were still fresh at his birth in 1925.The following are excerpts from the book "The Islamic Declaration" ("Islamska deklaracija"), written by Mr. Alija Izetbegovic, President of Bosnia-Herzegovina:"There can be no peace nor coexistence between the Islamic faith and non-Islamic social and political institutions" [ibid, p.23].During the war in Bosnia, 1992-1995, the Islamic Declaration was printed in tens of thousands of copies and distributed to military and police units loyal to Izetbegovic...Genegal Ratko Mladic was the first General to fight Islamic fundamentalism in Europe.Ossama Bin Laden played a key role in the 1992-1995 Bosnian civil war. He organized the recruitment of Arab-Afghan mujadeheen “volunteers” for Bosnia.Al-Qaeda forces were actively fighting as members of the Bosnian Muslim Army under ultra-nationalist radical Muslim leader Alija Izetbegovic.The goal of bin Laden and Izetbegovic was to build an Islamic state in Bosnia where there would be no room for the Orthodox Serbs and Catholic Croats.Islam is a revolutionary ideology and program that aims at changing the social system of the whole world and order it in harmony with its regulations and ideals. Islam wants to destroy all the states and governments anywhere on earth which stand opposed to the ideology and program of Islam, regardless of the state or the nation that is in power. In 1993, when the Clinton Administration was strongly backing the Muslim President of Bosnia, Alija Izetbegovic, Osama Bin Ladin was regular visitor to his office, according to Renate Flottau of the German weekly, Der Spiegel.The Bosnian daily, Dani, reported that the Vienna Embassy of BiH issued a passport to Bin Ladin in 1993.Who started the ethnic and religious killings and massacres in Bosnia? The very first massacres in Bosnia were against Bosnian Serbs. On March 26, 1992, entire Serbian families were massacred in northern Bosnia near Bosanski Brod in the village of Sijekovac. From April 3rd to 6th, 1992, Croatian regular army troops, who had moved illegally across the border into Bosnia, massacred 56 Serbs. On April 4, 1992, armed Bosnian Muslims from Korace killed 117 Serbs, old men, women, and children, who were Serb refugees from Barice and Kostres. Tens if not hundreds of Serbs were killed before the war/conflict in Bosnia even started. Jonathan Eyal, director of London-based Royal United Services Institute, stated that Izetbegovic was not only responsible for atrocities committed by Bosnian Muslims, Iranian and Arab mujahideen, the declaration of independence, which was unnecessary and when it was abundantly clear that it was leading to the war, for gambling with the destiny of his people, but also for the corrupt, single party state he was attempting to establish and for the rule through nepotism...Ratko Mladic is a tragic hero because he fought the rising tide of Islamic fundamentalism and neo-fascism in the Balkan.Western media monopoly characterizes Mladic as a villain, as if newly discovering that war by nature is ruthless. 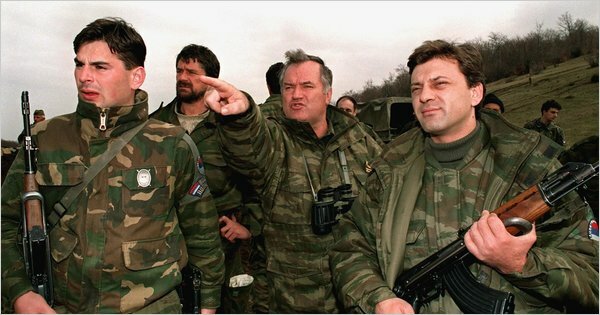 ... PHOTO: Ratko Mladic in Srebrenica...Was 'Srebrenica genocide' a hoax?.....Yasushi Akashi, former UN Representative in Bosnia, admitted in the Washington Times of 1 November 1995, that “it is a fact that the Bosnian government forces have used the ‘safe areas’ of not only Srebrenica, but Sarajevo, Tuzla, Bihac, Gorazde for training, recuperation and refurbishing their troops.” In other words, the so-called safe areas were used as military posts to train Mujahedin fighters from Afghanistan, Iran, Syria, Turkey and the entire Islamic world, free to commit their treachery by attacking Serbian villages and returning like thieves in the night back to the safety of their UN protectors who conveniently looked the other way to these violations. Prior to the events at Srebrenica, these “Holy Warriors of Islam” had attacked 42 surrounding Serbian villages and over 1300 Serbian villagers had been slaughtered without fear of being reprimanded or punished by the UN. Yet, when Serbs were provoked to retaliate against these Muslim assaults from these so-called “safe-areas,” they were condemned by the entire world.Especially disturbing was a religious dimension to the killings. Men were castrated in an anti-Christian gesture of circumcision. Pregnant women were disemboweled with cuts in the form of a cross. Some people were crucified, nails driven through their hands. Srebrenica was not a purposeful slaughter of innocent civilians, but an effort by Serb forces to save the lives of their countrymen from an enemy army that had already spilled ample blood, and which was cowardly seeking refuge in protected civilian areas that were supposed to be unarmed, and therefore demilitarized.Srebrenica became a centar of terrorist activities-jihad-carried out by the 28th Muslim Division under the command of Naser Oric and with the participation of Arab mujahideen. Philippe Morillon:"The fall of Srebrenica in 1995 was the "direct reaction" to the massacres of Bosnian Serbs by Naser Oric's forces in 1992-1993"... Morillon acknowledged that Oric's troops had committed war crimes in eastern Bosnia. Morillon personally witnessed the exhumation of the bodies of Bosnian Serb civilians and soldiers who had been tortured, mutilated, and executed. He saw with his own eyes the Serbian villages that had been burned to the ground in the Srebrenica pocket....Forensic specialists of the Hague Tribunal are perhaps the only professionals in their field in the entire world who do not depend on material evidence in order to determine the manner (and sometimes even the cause) of death.The International Commission on Missing Persons (ICMP) is doing DNA analysis to determine the identity of the victims, but they’re doing absolutely nothing to determine how any of them died, which makes it impossible to say how many of them were victims of a war crime and how many were simply victims of the war or belligerents killed in combat.The International Commission for Missing Persons, also known as ICMP claimed that it has “closed 5,564 cases of Srebrenica victims” and that “only about 1,500 remain to be resolved.” However, that announcement is completely at odds with science. By calling persons that it has allegedly identified by using DNA techniques “Srebrenica victims” ICMP is taking a clear position that they were in fact executed prisoners (victims, rather than legitimate combat casualties) and also that their deaths are related to Srebrenica events of July of 1995. Both suggestions are false. DNA technology serves only to identify mortal remains or reassociate disarticulated parts of the same body, but it has absolutely nothing to say about the manner or time of death. ICMP has no means to differentiate “victims,” i.e. executed prisoners, from persons who perished in combat and whose death therefore is not a war crime.....During the Bosnian war between May 1992 and July 1995, several thousand Muslim men lost their lives in Srebrenica and its surroundings. Most of them died in July of 1995 when the enclave fell unexpectedly to the Bosnian Serb Army and the Muslim garrison attempted a breakthrough. Some escaped to the Muslim-held town of Tuzla, 38 miles to the north. Many were killed while fighting their way through; and many others were taken prisoner and executed by the Bosnian Serb army.New York Times, July 17, 1995 by Chris Hedges: Some 3,000 - 4,000 Bosnian Muslims who were considered by United Nations officials to be missing after the fall of the Srebrenica enclave have made their way through enemy lines to Bosnian Government territory.Phillip Corwin, former UN Civilian Affairs Coordinator in Bosnia during the 1990s, said: “What happened in Srebrenica was not a single large massacre of Muslims by Serbs, but rather a series of very bloody attacks and counterattacks over a three year period which reached a crescendo in July of 1995.” The list of 7,000-8,000 Bosnian Muslims contains the names of the individuals who have been reported missing — it is not the list of the victims of a crime, those who have allegedly lost their lives during Srebrenica takeover. There is a world of difference, victims of the war crime are men who have been captured and executed without trial, while the victims of war are individuals who were killed during the battles, like Bosnian Muslim troops from Srebrenica column, which suffered heavy casualties after being engaged in battle with the Bosnian Serb Army.An International Committee of the Red Cross (ICRC) report, document #37, dated September 13, 1995 states: “Approximately 5,000 Srebrenica Muslim troops left the enclave prior to its fall. The Muslim government has admitted that these men were reassigned to other units of its armed forces....https://www.youtube.com/watch?x-yt-ts=1422579428&x-yt-cl=85114404&v=WiiWJkA-aQY#t=45..